Tiles allows active tasks to be easily seen and managed within role or task-based desktops. Ideal for knowledge workers who have to switch between projects, tasks, or roles, Tiles enables intuitive navigation between the applications they need most to do their job. 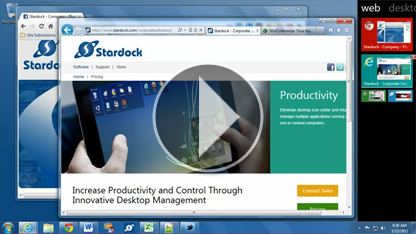 Create multiple desktops with specific applications and files based on a task or a role. Switch between "virtual desktops" that show the necessary applications for completing the task. Running multiple browser sessions results in crowded browser tabs or stacked icons on the task bar, making it inconvenient to find the session you need. Tiles solves the problem with a live thumbnail image of each browser session that can be maximized with a mouse click. Individual Tile pages can be configured by administrators to facilitate or limit the tools and resources accessible to users. With screen-size increasing all the time and dual monitors becoming more common, getting to the taskbar takes more effort. Tiles puts the tools users need where they can find them easily and get to them quickly. Tiles can be placed on the left or right of primary or secondary monitors. This allows for ready access to the applications you use the most.